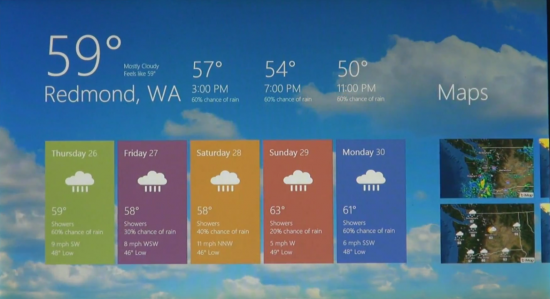 No secret that today Microsoft showed what the interface will be like coming in next year’s Windows 8 (if you do not know what it looks like – see below, there are screenshots and video). At first glance it looks very cool, at least, is a global rethinking of the operating system interface. But let’s try to look deeper and really understand all of its pluses and minus. Similarly, it should be noted that Apple is already doing something like that – trying to pull together its mobile iOS interfaces and desktop Mac OS X. Microsoft has a Windows Phone 7 OS for phones and Windows 7 desktop and tablet, but it is no secret that, as a tablet operating system is not very suitable Windows 7. 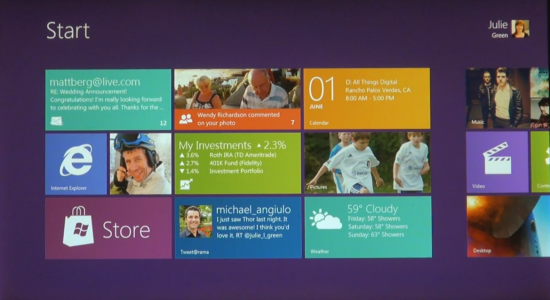 The main interface Windows 8 is very similar to Live Tiles Windows Phone 7. Almost every application has its own widget (or it is itself a widget). Appendices thumbed through one after another, and there is even the tiles – that is, although all of the programs for the new full-screen interface, one screen can display two applications. One of them will be “fine” mode – in the form of columns on the one hand, and the other just a little bit compressed. Immediately we can say that if everything goes really well, as shown in the video, it will be a significant step forward for both Windows Tablet OS. About the benefits of various solutions, we can argue for a long time, but that it is definitely better suited for devices with a touchscreen – it is definitely. On the other hand, on the desktop it still looks quite strange, especially since the old interface with standard applications and the taskbar is still here – it will be run by “old” applications. 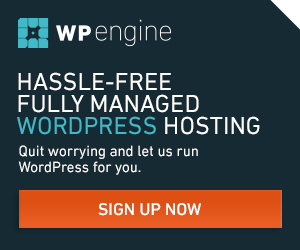 Both interfaces will exist side by side, that looks a bit … awkward? However, Microsoft never was love for radical solutions, and always preferred to compromise. In any case, the use of “old” applications on the tablet will be the same anguish, as now, and users will have to wait until developers Beta. Keyboard for the horizontal position of the screen. This we have seen - there was such, Microsoft Natural. 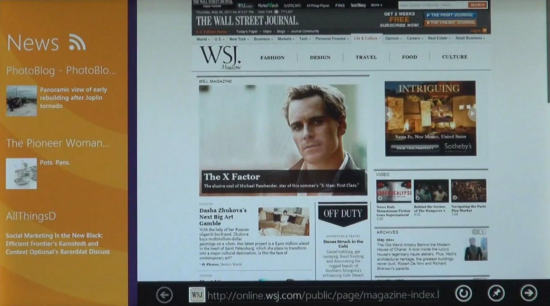 It is interesting that Windows 8 will be placed on a computer with an ARM, but (Warning), these computers will go only to new applications, which is quite logical. In general, summing up one can say that Microsoft’s decision to bring its desktop OSes for mobile may well bear fruit and has certain advantages. Thus, new applications will be developed for both desktops and laptops, and Tablet. And the new interface is quite good, although perhaps it could be more user friendly. But still better than the outdated “Start” button and taskbar. Quick launch apps from the tiles on the home screen, which replaces the “Start” menu. As in Windows Phone 7. Dynamic tiles with notices, which always show relevant information from the application. Convenient, intuitive switching between applications. Improved Snap for easy snap windows to screen edges and change their size. Optimized for touch screens IE10.